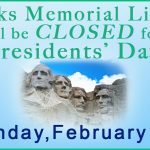 Brooks Memorial Library will be CLOSED on Monday, February 18th, in observation of the Presidents’ Day holiday. If we get more snow, don’t forget to check out some SNOWSHOES! Since the Uniform Monday Holiday Act passed in 1971, it has been celebrated on the third Monday in February. Originally created as a celebration of George Washington’s birthday, it was later expanded to include Abraham Lincoln’s birthday, as well as being a way to honor all presidents, and celebrate other aspects of our national culture.